Beauty pageants aren’t just about bathing suit and evening gowns. For Alyssa London, they’re about reconnecting with your roots. 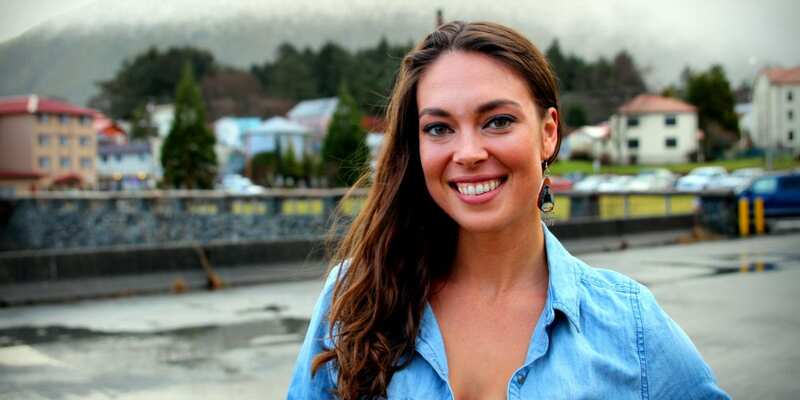 London is a contestant for this year’s Miss Alaska USA pageant and spoke with KCAW about her childhood outside of Alaska, her identity as a Tlingit woman, and her ambitious plans as a entrepreneur. In a way, Alyssa London said she was born to be Miss Alaska. “My parents named me Alyssa Kalyn because they wanted me to have the same initials as the state of Alaska, so my passion for the state runs deep,” explained London. That passion is rooted in her family ties to the state. London’s grandfather is Tlingit elder and Ketchikan native Ernie Boyd. London identifies as Tlingit, but she says that hasn’t always be easy. Her background is mixed, with European descent on her mother’s side and a father who is only part Tlingit. Growing up, London says she often questioned her grandfather about her Native heritage. “So I’m like, ‘Grandpa, why don’t I look like you?’ And he says, ‘You’re my little freckled Indian,’ and then he’ll take me to the Pioneer Cafe in Ketchikan and point out the Irish Aleuts or the Norwegian Yup’iks and he’s like, ‘See, we’re all mixed!’” London said. But not only is London mixed, she was also raised outside of Alaska, in a town just north of Seattle. It was there in the shadow of Microsoft’s headquarters that London’s tech-savviness and entrepreneurship was born. London eventually went on to attend Stanford University in the heart of Silicon Valley, where she wrote her honors thesis on economic development in Southeast Alaska. After college London landed a job at Microsoft. The company sends out gifts to its corporate partners across the world and one gift in particular got London thinking. “I was noticing that the purchase orders were for these ‘Made in Washington’ baskets called ‘the Northwest Native gift baskets,’ and so I looked it up online and saw what was in it. There was a little bit of salmon and popcorn, but I felt conflicted that it had that name and I knew the reason they were purchasing it, but there was a disconnect,” said London. So, London set out to make her own baskets, and in the process moved to Alaska and built a business. 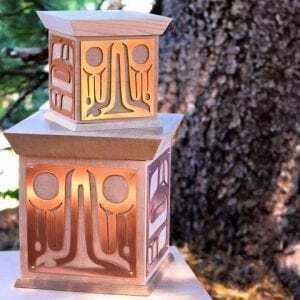 She calls it “Culture Story.” Right now she’s sells her own products like the Southeast Alaska Native Giftboxes she makes out of cedar and overlays with Tlingit designs cut from copper. Alyssa London sells Southeast Alaska Native Giftboxes through her company ‘Culture Story.’ Photo courtesy of Alyssa London. But London ultimately plans to use her business to showcase the work of other artists and vendors. “I really see my work with Culture Story as a way to solve that problem of economic development,” said London. London said her passion for business is what makes her perfect for Miss Alaska. She’s aware of beauty pageant stereotypes, but she just isn’t phased by any of it. “When people ask me, I just am really self assured about it, so they don’t have to really push me on it,” London explain. Alyssa London will compete at the Miss Alaska USA Pageant in Anchorage on Feb. 4.